Original Sumi-e on a Shiki-shi board. Sumi ink, Chinese chip colors. The golden frame is on the board itself. Size 24 x 27 cm. Artist Reply: Thank you, Joke! Artist Reply: Thank you, Sharon. Olga, I love your work! You've got a wonderful special style! Artist Reply: Thank you, Anneke! 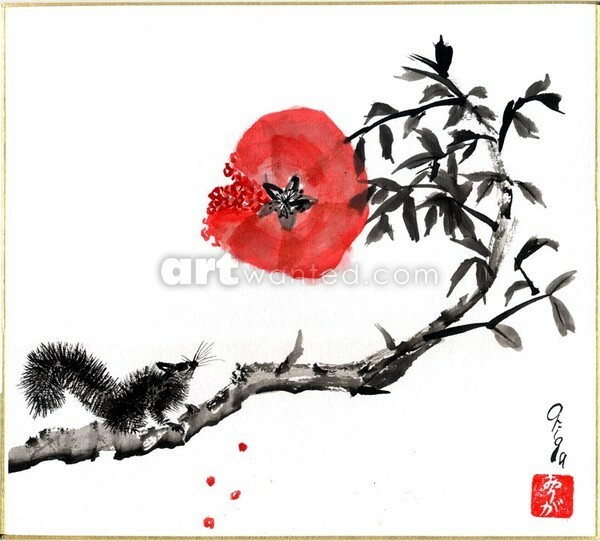 It's rather difficult for me to see if I really have some kind of "style' -- or just follow the mixed style of sumi-e and Chinese painting :) Appreciate your opinion, anyway !